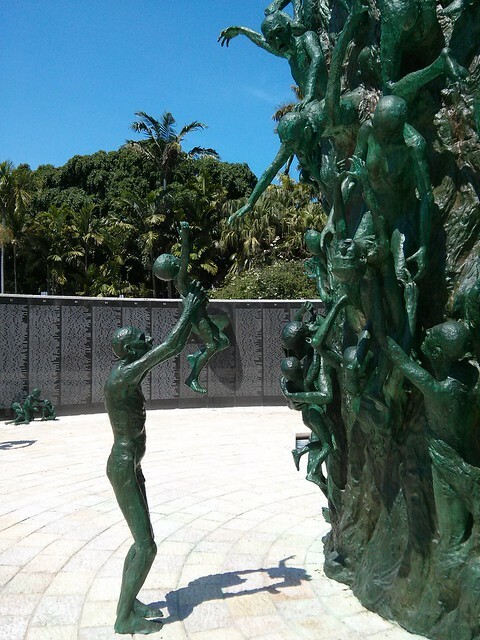 I did not enjoy my visit to the Miami Beach Holocaust Memorial at all. 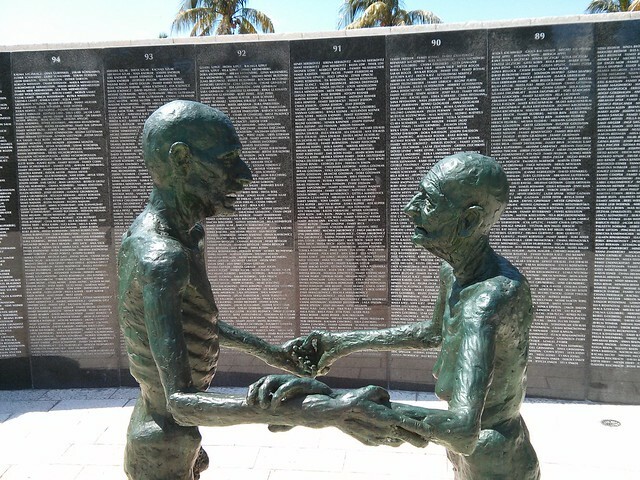 But the memorial in Miami Beach is different from others I’ve visited. Whereas others have often made me feel contemplative and solemn, this one horrified me. 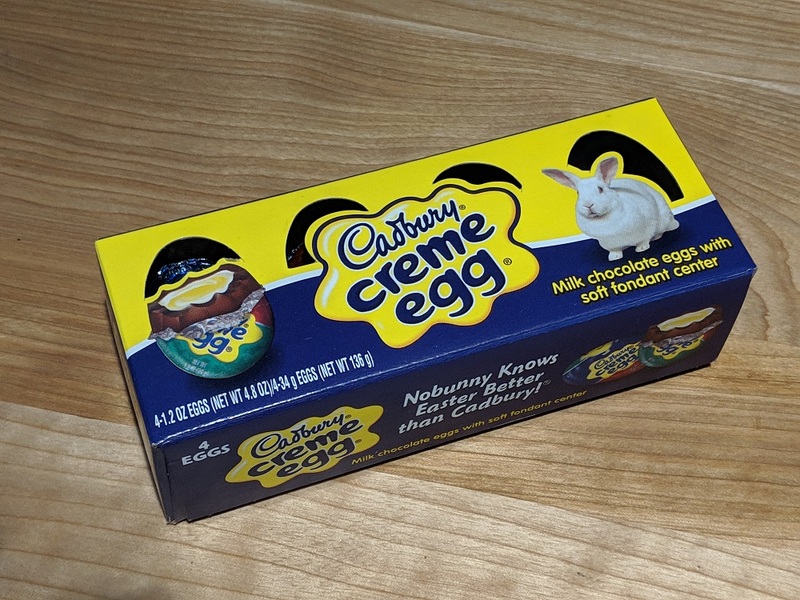 I mean that in the strictest sense: I was filled with horror. And I don’t exactly know if that’s what a memorial should do. It’s hard for me to admit that I didn’t like it. 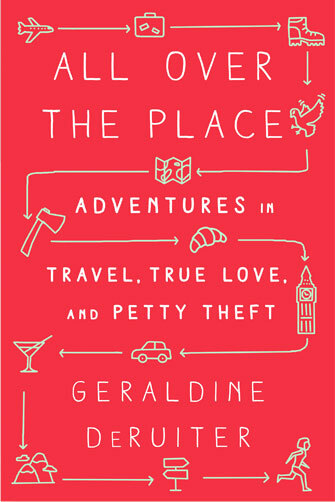 Reviewers on Yelp and Trip Advisor clearly disagree with me. And I’m sure that quite a few people will let me have it in the comments. They will likely say that I’m being disrespectful to those who suffered and died. That’s not my intent, obviously. Nor do I mean to suggest that the Holocaust was anything but horrifying. Instead, my issue is this: I feel like we have two obligations when it comes to honoring the dead. The first is that we need to acknowledge and celebrate their lives, in a tasteful and respectful way. And secondly, if they died tragically, or in a way that was preventable (indeed, if their deaths were due to genocide, or violence), then we need to acknowledge that, as unpleasant and uncomfortable as that might make us, and do what we can to make sure it doesn’t happen to others. But I’m not entirely clear that you can do both of those things simultaneously. I don’t know if you can honor and celebrate the dead and be graphic and honest about how they died, all in one go. 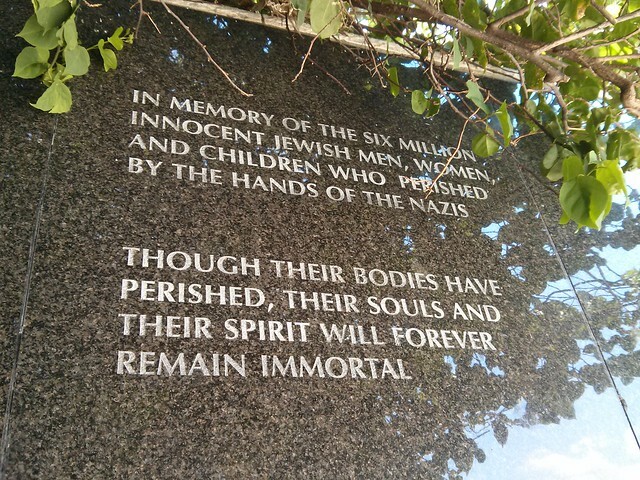 The Miami Beach Holocaust Memorial tries to do just that. 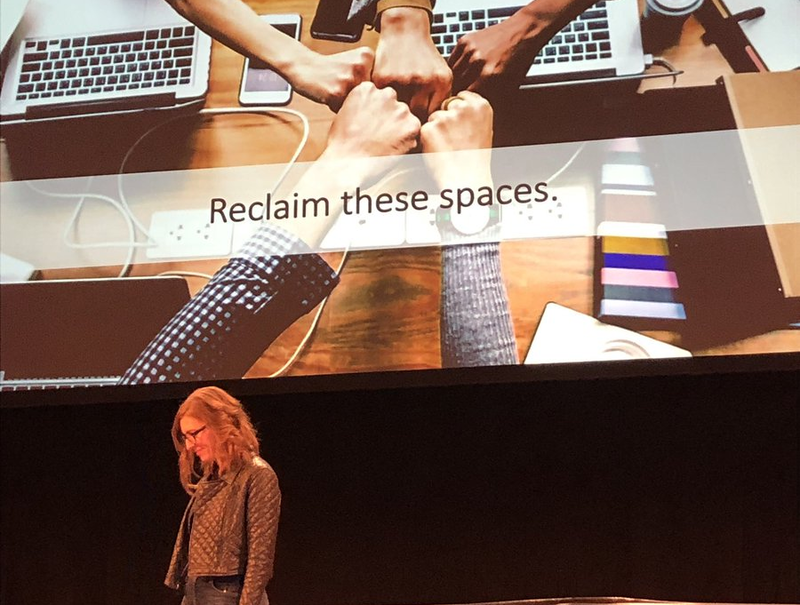 The result is … dissonant. 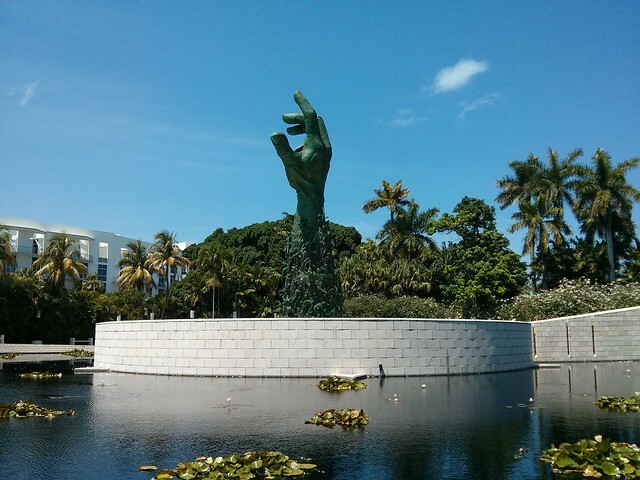 When I first saw the main sculpture, which lies just around the corner from the Miami Beach Botanical Gardens, I thought it was lovely. 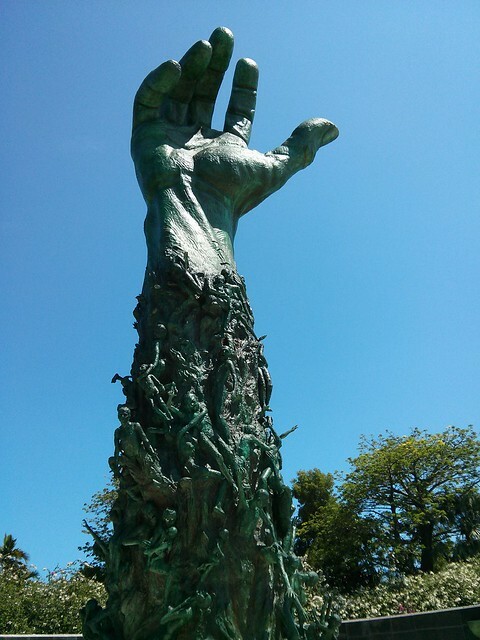 An enormous hand reaching triumphantly towards a blue sky. It got me thinking about the resilience of the human spirit, about how good really does win out over evil. I was completely misinterpreting it, but I didn’t know that yet. The statue sits on a circular island at the center of a man-made pond. The Arbor of History – a wide walkway, flanked by a stone wall – winds around the perimeter of the pond. 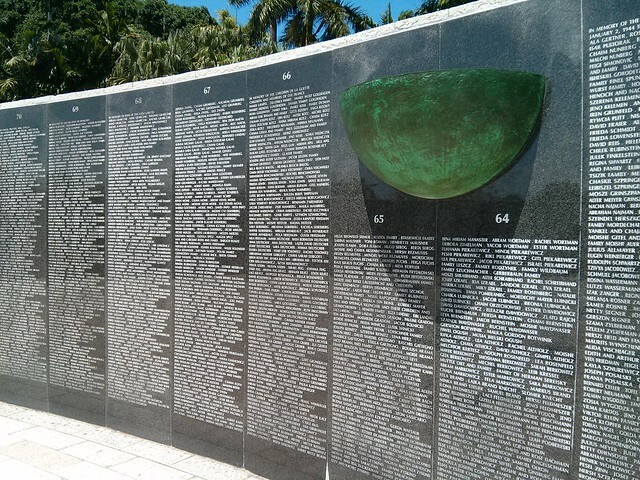 I followed it, somewhat shaded from the searing heat, looking at the photos and words inscribed on the wall. 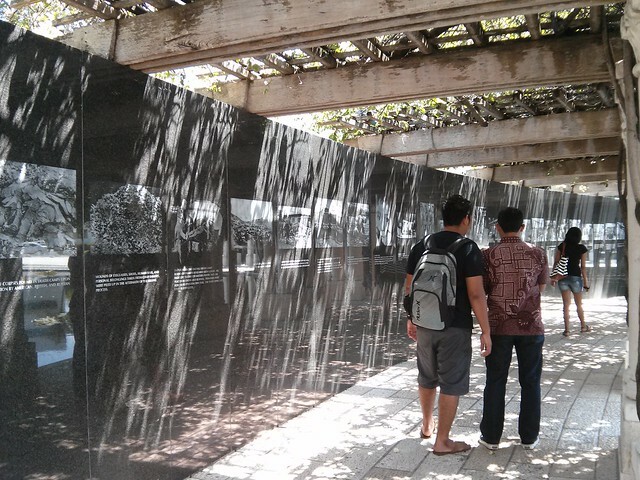 These panels walked a visitor through the history of WWII and the Holocaust. 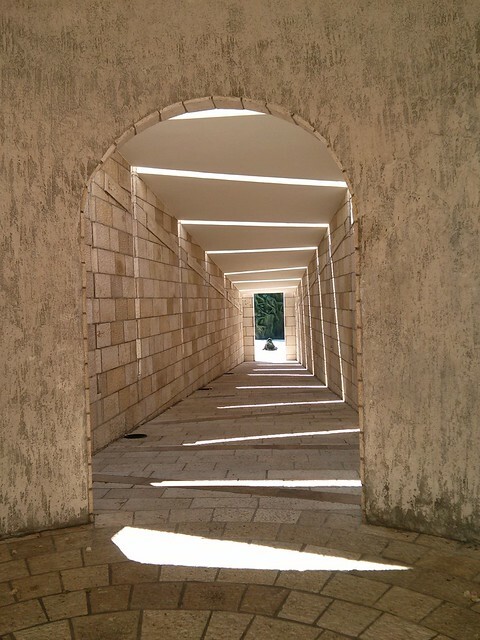 The Arbor of History wound around, leading towards an eternal flame and The Lonely Path – a long hallway. 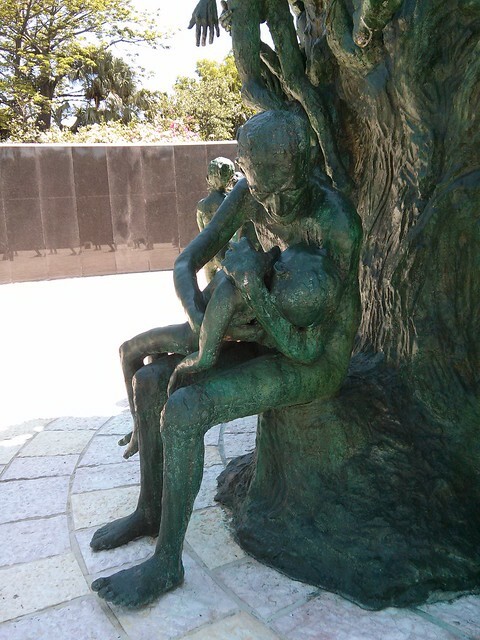 This was, by far, my favorite part of the memorial. I thought it was somber and beautiful. 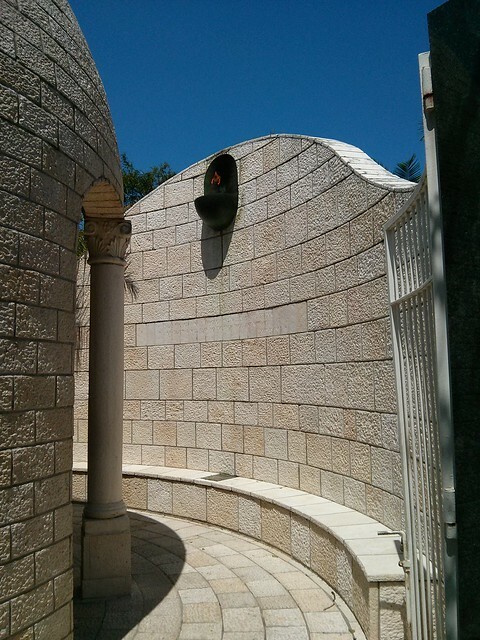 As I walked down the Lonely Path, an audio recording of children chanting in Hebrew emanated from some invisible speaker. 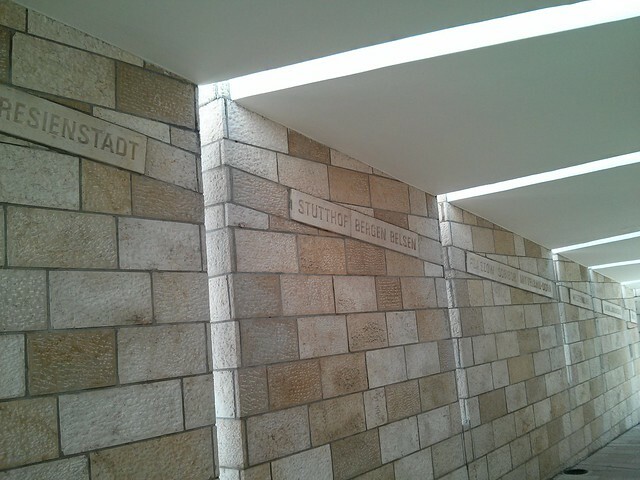 Looking up, I noticed the inscriptions on the wall – the names of all the major concentration camps. At the end of the path, I could just make out a small figure. I wasn’t sure of what it was, so I headed towards it. 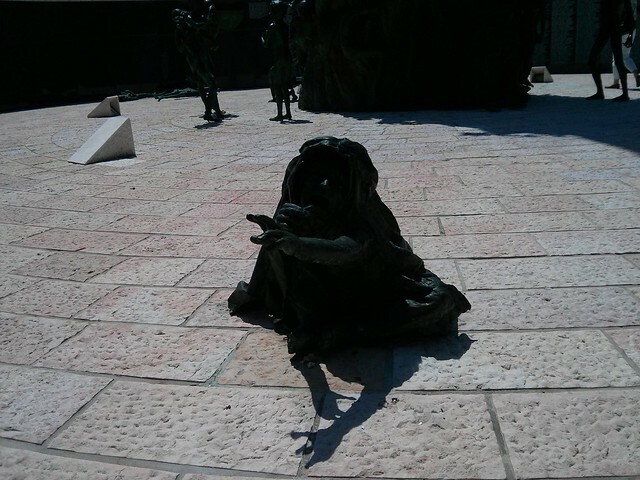 It’s hard to see from this next photo (my apologies for the quality – I had only my camera phone), but as I neared it, I saw that it was a statue of a woman, erupting from the ground. Her face was in agony as she reached out towards me. 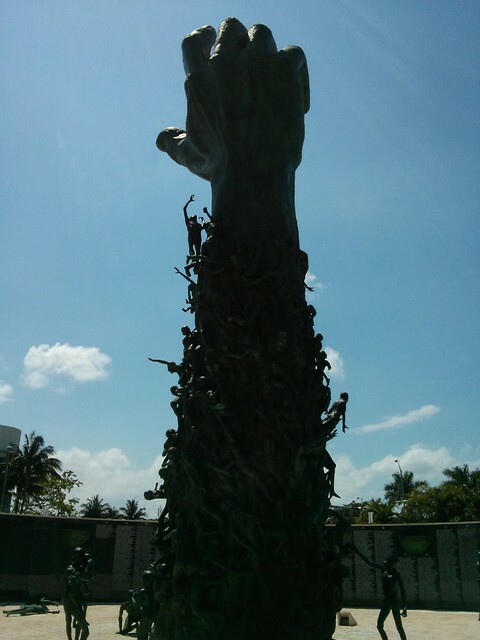 I realized that I was now standing at the base of the main statue I’d seen earlier. 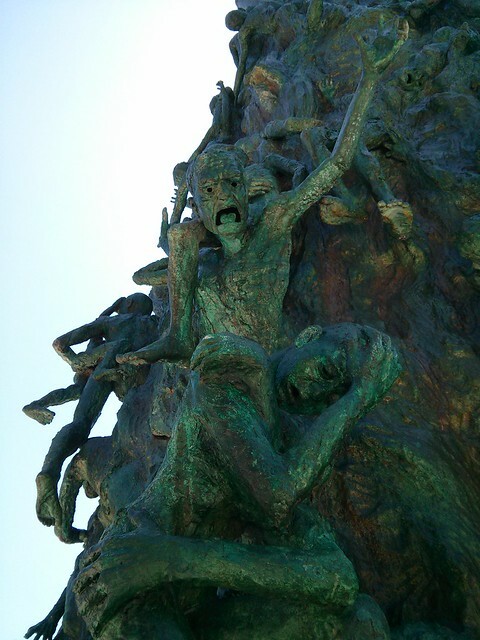 The bottom, I could now clearly see, was composed of hundreds of naked figures, slightly smaller than life size, writhing in agony. What I had thought was a hand reaching out in triumph was clearly not that. It was reaching out in desperation, pleading for help. Each of the figures wore a different mask of pain. Some were angry. 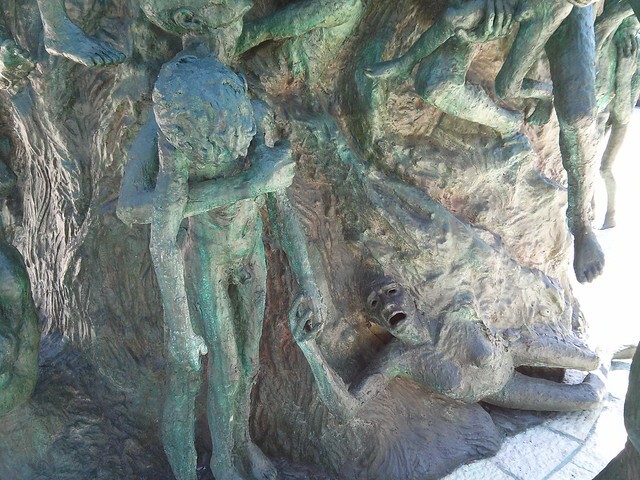 Many of the figures were of adults cradling dead infants and children in their arms. 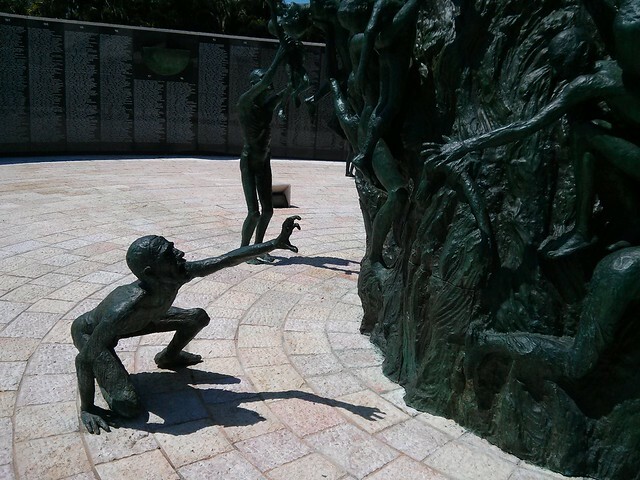 The statues spilled out onto the base of the memorial, reaching out towards those that were caught in the mass of bodies. 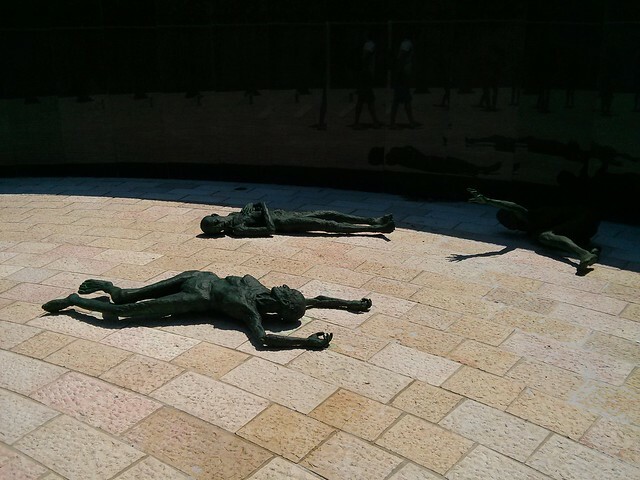 Some were on the ground, seemingly in the throes of death. 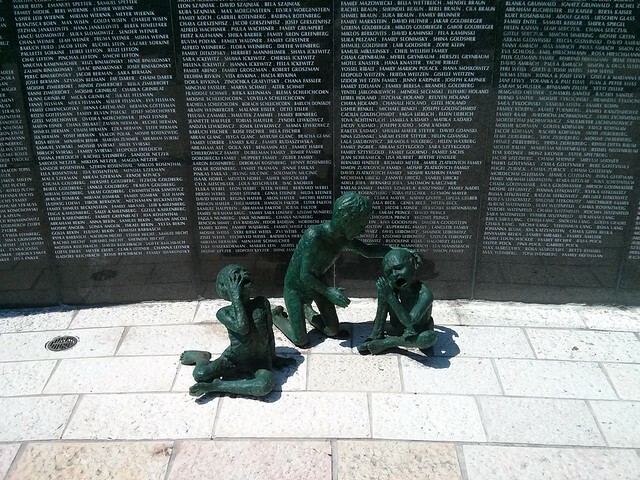 A cluster of statues of weeping children was not far off. I stood, so transfixed on the visages of horror that I nearly failed to notice the many names inscribed on the wall behind them. And it was at that moment that I realized that the memorial was at odds with itself. 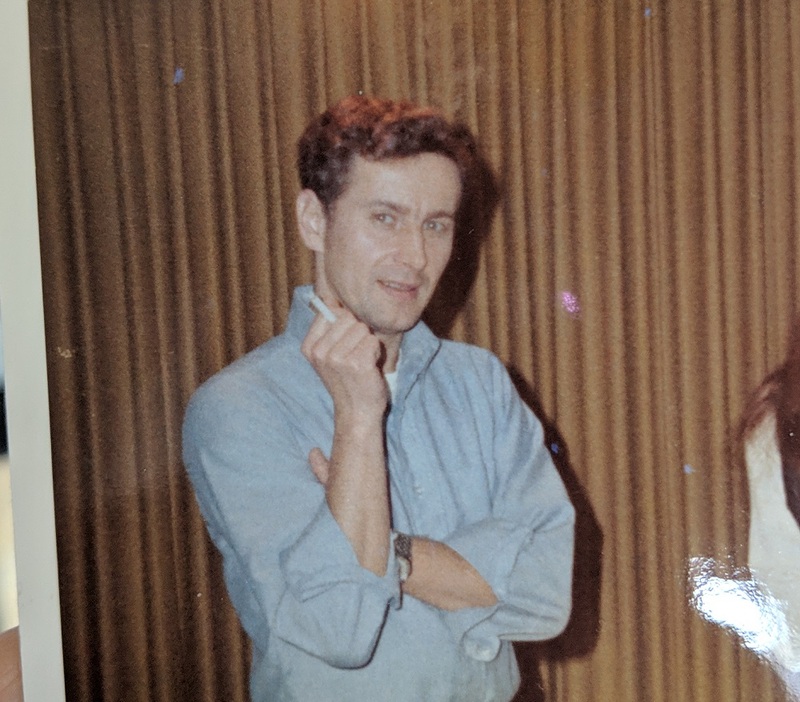 I wasn’t so much thinking about those who had died as I was thinking about how they had died. I agree that both are important, but while one fills you with contemplative grief, the other fills you with horror. That, to me, seemed wrong. 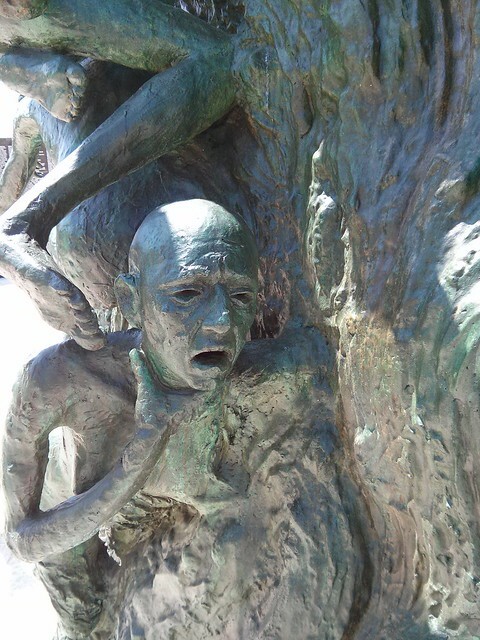 The Holocaust was horrifying (this isn’t debatable), but I feel like a memorial to the dead should allow us room to feel other things – like grief, and despair, and reflection. But perhaps, given the nature of what happened, being horrified really is the only appropriate response.